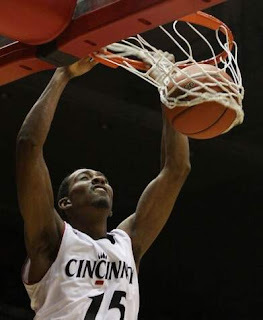 The Cincinnati Bearcats improved to 8-3 by besting the Winthrop Eagles by the score posted in the title. It was a tale of 2 halves for the Cats, as they dominated the first, and struggled in the second. Scoring is going to be a problem with this team all season. A second half drought, coupled by turnovers and the fact they thought they had the game put away, let the Eagles chip their way back into this one late. Deonta Vaughn, who didn't shoot in the first half, hit back to back 3s to put this one out of reach and the lead at 16. Vaughn finished with 11. The first half scoring was taken care of, in large part, by Yancy Gates. Yancy had 14 in the first half, and was invisible in the second, finishing with a team high 16. The third Cat in double digits was Ibrahima Thomas, who had 11. Thomas got his second start of the season and played hard. For Winthrop, Charles Corbin lead the way with 12 6 3 and 3 steals off the bench. He had 5 offensive rebounds. Matt Morgan and Mantoris Robinson both chipped in with 10. Mantoris is such an incredibly cool name. I wouldn't mind if he transfered to UC, or we would play them again. The front line was the story early on. The Bearcats used a 12-0 run to turn the score from 12-11 to 24-11 and Winthrop didn't have an answer the first half. The Cats shot 50% and had 23 rebounds, many of them offensive. There was a spot where after Cashmere Wright missed a 3, got his own rebound, the second of the possession, and got the ball to I think Steve Toyloy for a lay up. Cashmere looked much better this game. He played with a lot of confidence and filled up the stat sheet by going for 5, 3, 3. And more importantly, zero turnovers. Cashmere made the only UC 3 of the first half as well. The team penetrated a whole bunch in this half. Lance Stephenson didn't do much by way of scoring, but fed Yancy Gates for easy lay ups a few times. The Cats had 12 first half assists. The halftime lead was 16. The second half was a different story. This is was an example of what can not happen a week from now when Connecticut comes into town. The ball died with whoever had it. The rebounding ferociousness of the first half went away. The team looked complacent. This team is not good enough to be complacent. After Ibrahima Thomas had a quick scoring furry to get the lead to 19, the Cats took the foot off the breaks. At the 16 minute mark, the Cats lead 50-34. It would take 2:30 to score again, a Jaquon Parker 3 to put the lead, which was cut to 11, back to 14. Lance Stephenson, who had 8, made his first shot since the opening 2 for UC to make the lead 13 at the 10 minute mark. The Bearcats fell asleep again on offense. Turnovers haunted UC. The Cats turned it over 11 times in the half, many of them here. The Bearcats didn't score for 3:30 as Winthrop had the lead to 9. The aforementioned Vaughn 3s came here to put this one on ice. If the Bearcats had played a better offensive team, this one could have been a barn burner. But, the Bearcats played fantastic defense yet again, and held the Eagles to 37.5% shooting and 2/11 from 3. The Bearcats shot 51% for the game. The problems were from 3 they shot 6-19 for 31.6% and another horrible free throw shooting game going 16-27 59%. Lance Stephenson was off going 0-4 at the line. Steve Toyloy, who had 6 boards and played well, bricked both his attempts. The rebounding was great. The Bearcats missed 25 shots, but got 14 offensive rebounds. Winthrop missed 35 shots, and got 11 of them back. It seemed everyone had a hand in on rebounding last night. Rashad Bishop lead the team with 8, Yancy had 7, Toyloy 6, Vaughn and Stevenson 4, and Thomas, Parker and Wright all had 3. Offensively, Gates had 4, Bishop 3, and Thomas and Toyloy had 2. Nice job overall rebounding. UConn is up next a week from today. I'll get some fresh, new content up here the next few days, so keep checking back. There probably won't be a post on Christmas, but still check anyway because it would be a nice present to me.